When I was younger I could never get my head around how do the masters play so precise? It seems like they almost foresee all my moves. I worked on tactics, strategy and positional chess but there was something MAJOR missing preventing me from playing much better. And that missing piece was… the PROPHYLAXIS. Prophylactic thinking is the habit of constantly asking yourself “what my opponent wants to do” and the ability to find a good reply. Right now, there are thousands of chess players out there… who have no idea how much they are being held BACK by poor prophylactic skills. Prophylaxis is the art & science of preventing your opponents’ threats. The result is an incredibly valuable course that gets our highest possible recommendation for ANYONE who takes chess seriously! 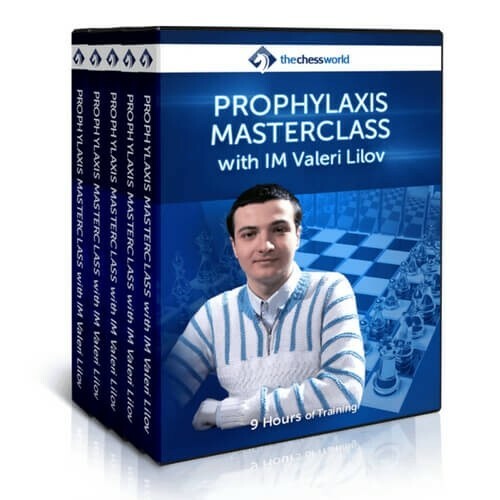 In this 9-hour video course, IM Valeri Lilov has adopted the same Prophylaxis Chess principles that have been proven effective time and time again by classic players (think Aron Nimzowitsch) and bridged the gap to the chess players’ needs of today! Downloadable, complete set of PGNs of everything covered so that you can analyze it at your own pace and convenience. A must-have treasure chest for any serious player. Watch IM Lilov annotating his games while applying the principles covered in the course. A must-have for any serious chess player.